That silly sci-fi dream of invisible screens that magically display graphics is inching towards reality. 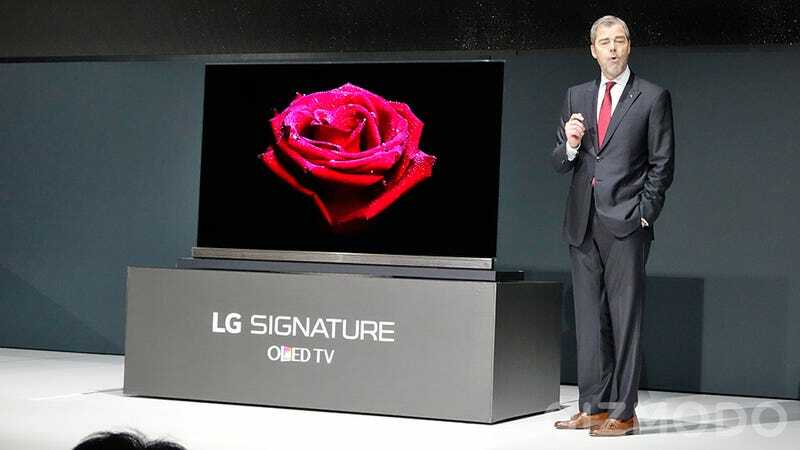 Thanks to LG, the world can now lust after a television that looks like it’s nothing more than a pane of translucent glass—and a very thin pane of glass at that. LG’s new OLED 4K TVs are just a tenth of an inch thick. (They’re 2.57-millimeters thick, to be exact.) The company just announced its G6 and E6 series, which come in both flat and curved form factors. The so-called Picture-on-Glass design is exactly what it sounds like: a brilliant Ultra HD Premium image with HDR Pro. If the Premium and Pro designations are throwing you off a bit, that’s okay. The newly announced Ultra HD Premium standard comes straight from the UHD Alliance and is assigned to products “that comply with performance metrics for resolution, high dynamic range (HDR), peak luminance, black levels and wide color gamut among others.” HDR Pro is a bit of marketing from LG in an attempt to express how the new TV lineup is better than the old ones, which featured regular old HDR. Then again, this is where TV companies tend to be pretty subjective in labeling features since there aren’t exacting standards. That said, the G6 and E6 televisions look amazing. Featuring DolbyVision and something called “Color Prime® Pro technology,” the OLED picture quality is cutting edge. And since a 2-millimeter thick pane of glass can’t exactly hold speakers, the new TVs come with a built-in harman/kardon sound bar. On top of the hardware, you’ll also get the latest version of webOS 3.0 with the ability to access your favorite streaming and broadcast apps. Both the G6 and the E6 come in 65- and 55-inch sizes and will hit the market in 2016.